Today we appreciate your loyalty in patch full of some surprising changes. Read on to find out more. Today we are releasing what we like to call a Loyalty Patch. We cannot express enough how much we appreciate the continued support of our players. We wouldn't be here without you. This will be the last patch before we enter into B2P and release Faeria's next expansion, Fall of Everlife, next month. On the home screen you'll notice a few changes to the links on the right. Most prominently, you'll see a golden link that will lead you to four brand new puzzles. 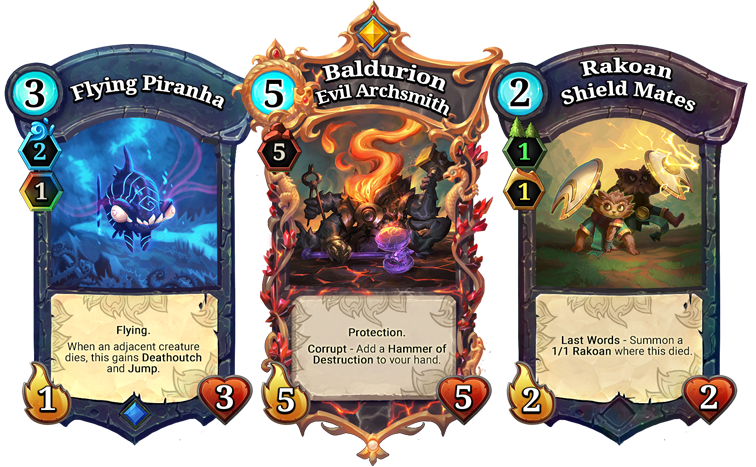 These puzzles will introduce three new cards coming in the Fall of Everlife, as well as demonstrate the new keyword: Corrupt. Complete all four of these puzzles and you will be rewarded with the Orb of Loyalty. It's the least we can do. Wear it proudly. The following three cards are showcased in the puzzles released today. All three will be available in the Fall of Everlife expansion. To receive these cards, you must complete the prologue and log out and back in some time before Monday. Older accounts will receive these cards if they do not have them, but may need to log out and back in to properly receive them. We're introducing a new change to three existing cards in Faeria. While developing new card technology for Fall of Everlife, we created a way to add cards to your hand that have their land requirements completely converted to Wild. Cards that take advantage of this will use the new phrase: "It becomes Wild." We decided we could apply this technology to a few existing cards - and so we did. All Dragons added to your hand now become Wild. Time of Legends' back-up ability has been reworked. If there are no Legendaries in your deck, it instead adds a random Legendary directly to your hand. It becomes Wild. No longer asks you to pick a color. The Legend that is added to your hand now becomes Wild. Land requirement for Magda increased from 0 to 4 Wild lands. When adding this new flexibility to Magda, we recognized she was dramatically boosted in power. We've lowered her Legend discount and added a Wild cost to her to prevent an early Magda play from dominating the game unchecked. Day of Dragons has received a similar adjustment by slightly lowering its discount. It should be noted that these three cards will be locked from disenchanting due to the free card giveaway, and will remain that way through the upcoming transition to B2P. Only the first creature summoned on the land that turn gains +2/0. We mentioned earlier that we were keeping an eye on decks that specialize in focusing extreme amounts of burst damage to the face using Path to Paradise and Rakoan Chieftain. After further observation and discussion, we are convinced a change is necessary. While this deck style is typically only seen at high levels of play, we do feel it creates too many situations where the opponent is relatively helpless, and does not promote gameplay we believe is healthy for the game. Ancient Herald now checks the creature's actual life rather than the original life with its Gift ability. Battle Toads now requires one less click to use. Wind Gate movement can now be cancelled. Flash Wind choice pop-up is removed. You can now directly click on a creature and it will cost the appropriate amount of Faeria. Seed of Paradise land order has been standardized to be in line with Earthcraft and other similar effects. Manta Rider will now give its token to its controller rather than the person who played it after a 'mind control' effect. Unfortunately, with today's patch we will officially be ending our support for mobile platforms. We've discussed our reasons for this in more detail back in March, but know this may still come as a surprise for some players. As we gear up for B2P and Fall of Everlife this month, we are focusing entirely on our PC versions. In closing, thank you for your continued loyalty! We hope you enjoy today's new content and mechanics. See you next month in Fall of Everlife.